Arnora Auria is an Imperial spellsword who recently had a falling out with her boyfriend, Jorundr, who is jailed for robbery and murder. She'll ask you to help her get the gold Jorundr stole during the last robbery and hid before he got jailed, in Two Sides of the Coin. People around Bruma feel sorry for Arnora. They will discuss with one another how Jorundr wronged her: "You hear about Jorundr? He was caught stealing gold, and now he's in jail! I bet Arnora's beside herself with grief. ", and "Poor Arnora. Seems her boyfriend, Jorundr, has stolen some gold from her and left her penniless. Now he's in jail, and she's destitute." Approaching Arnora won't grant you much hospitality, as she'll bluntly ask you, "What do you want?" When you talk to her, she'll angrily utter, "Can't you see that I'm upset?" When asked about Bruma, however, it becomes apparent she cares little for Jorundr, instead being preoccupied with wealth: "I can't help myself. I'm just a sucker for well-heeled men. That Olav, for example, at the Tap and Tack. He's dreamy. And successful, too." If you leave before inquiring about Jorundr, she'll just say goodbye with, "Good riddance." Jorundr knows where the gold is stashed. After hearing people discuss Jorundr getting thrown in jail, you can ask around town about Jorundr, to which people will tell you: "Arnora and Jorundr were once a happy couple, but that's over now. I hear that he took all of their money and stashed it after he committed a robbery." If you ask her about Jorundr, and her disposition towards you is less than 60, she won't be willing to talk about him: "Our affairs are none of your business. I don't know who you are, and you think I'm going to talk to you about my ex-lover?" Otherwise, she's willing to let you help her get the gold Jorundr hid: "I suppose I can trust you with this information. After all, if you can help me recover my stolen gold, you may find yourself earning some of it." You can then require about the stolen gold, and she'll elaborate: "I know what you've heard, all about Jorundr and his run-in with the town guard. Well, let's just say it isn't exactly all true. I may have let a "detail" or two leak out, to entice someone such as you to assist me. Until you agree to my scheme, I don't want to say more. All I can promise is that you'll be making a lot of money. Are you in, or are you out?" If you refuse to get involved, her offer will remain: "Suit yourself, but I have a feeling that you'll be back." She'll repeat herself when you leave the conversation: "You'll be back..." When you return, she'll ask you, "Change your mind?" If you speak to her again, she'll tell you, "I knew the lure of gold couldn't keep you away long." If you choose to get involved, she'll reveal the details: "Smart answer. Here's the deal. Jorundr and I have had a rocky relationship at best. Against my will, I've been dragged all over Cyrodiil helping him commit petty crimes. I wouldn't say we're thieves. I mean, we've stolen things... sure. But we've never stolen that much at one time. Just enough to keep us going. That is, until last year. Jorundr started to take risks and began robbing more dangerous targets. Not just lone merchants, mind you. I'm talking about the bigger scores. Like estates and tax shipments. I begged him to stop, as I knew that his capers would one day lead to violence. He just threatened to... hurt me if I got in his way. I think the gold changed him. I really do. He wasn't the man I met seven years ago. The few times I tried to say something, he'd strike me or push me away. I began to become frightened of him." When you ask her what this has to do with you, she'll go on: "Our last score was a tax shipment being delivered to the Imperial City. We robbed it, and in the midst of the chaos, Jorundr killed a guard. I was mortified. We snatched up the gold and holed up in the mountains. He said if I breathed a word of the murder to anyone, he'd kill me. I was terrified of him at this point. Two days later, the Bruma City Guard traced us to our makeshift campsite. I was off gathering food, but Jorundr was captured. Served him right. When I went back to the site later, the gold was gone! He'd moved it! What I need you to do is go to the Bruma Castle Dungeons and speak to him for me. Convince him to tell you where the gold is and then we split it." At this point she'll leave the conversation with, "He's not likely to just come out and tell you, so get creative!" After this, if you approach her again, she won't be able to add any more information: "I don't know what else to say. ", and she'll greet you with, "Until you get some information from Jorundr, I don't have anything else to tell you." When you've talked to Jorundr, who refuses to speak to you outside of a jail cell, you can return to Arnora, and she'll ask you when you approach her, "Did that fetcher give you any information?" When you greet her, similarly, she'll ask, "Did you pry any information out of him?" If you tell her Jorundr is not cooperating, she'll be angry: "Typical. So typical. His stupid paranoia that everyone's a spy and out to get him. I don't know what to suggest. Seems the only way he's going to tell us anything is if you end up in jail with him." If you inquire about the stolen gold at this point, she'll add, "We have to get him to tell us about the gold. Use any trick you can." Once you've gained Jorundr's trust, he'll ask to help him out when you mention the stolen gold. He explains he'll be jailed for a long time, accused of murder he claims he didn't commit, and he'll add, "I owe all of this to that heartless treacherous witch, Arnora." When you ask him what Arnora did, he will tell you his side of the story: "You want to know what happened? I'll tell you. I was betrayed. Stabbed in the back. I'm in here, and Arnora's out there living in my house. We were doing petty crimes all over Cyrodiil. Small scores; 10 gold here, 25 there. Nothing big enough to have them investigate you. Then along comes Arnora with a "plan" to waylay a tax shipment headed for the Imperial City. We're talking serious gold, complete with armed escorts. I told her she was crazy, but she insisted. Women have a way of getting men to do what they want. So we did it. We ambushed the shipment. In the process, Arnora killed a guard. I told her to be careful, and just knock them out but she didn't listen. We then buried the gold in the woods. Then she disappears to get "supplies." [sic] Suddenly the campsite gets raided by the Bruma City Guard. There's no way they could have found us. There's no doubt she tipped 'em off. But I was one step ahead. I had moved the loot while she was away. Hahaha. My final revenge. Or was it?" When you ask him to elaborate, he'll go on: "I'll tell you. I want Arnora dead. That's right, I said dead. She took my life away, now I want hers taken as well. You do this for me, and you get the gold. All of it. All I need as proof is that damn amulet she always wears. Show that to me and the money's yours." If you ask him about the stolen gold again after this, he'll just tell you, "You want the gold? You bring me Arnora's amulet... after she's dead." When you approach Arnora after hearing Jorundr's story, she'll mock you: "Welcome back to the world, convict! Hahaha." When you talk to her, she'll ask, "So, were you able to find out about the gold or not?" She'll show more disdain towards Jorundr when you mention him: "How could you stand sharing a cell with that imbecile?" Should you leave the conversation at this point, she'll just mock you some more: "Acquire a taste for rat stew while you were in there? Hehe." Mentioning the stolen gold, she'll insist he's lying: "So, he told you another one of his tall tales. I hope you didn't believe him. What's he got in store for me? He send you to kill me? Is that it? What if there was another way? What if he thought I was dead, but I wasn't. Then he'd tell you the location of the gold! What did he need as proof?" When you tell her her amulet, she'll be annoyed: "That fetcher. He knows this is the only heirloom I have left from my family. Only he would stoop so low. Look, I know you could just kill me where I stand, but what if I gave you the amulet and you bring it to him. Then he'd say where the gold's stashed. You kill me here and now, and as far as the town guard is concerned, it's a crime. So you make your choice. You want to do it my way, or Jorundr's?" You now have to choose who to side with, which affects how the rest of the quest will play out. You must either kill her or hear out her plan. If you choose to kill her after hearing out her plan, the quest will fail, so be careful what you choose to do. If you tell her to do it Jorundr's way, she won't sound like a damsel in distress this time: "Then prepare for the fight of your life! If I fall, you'll just end up rotting in jail with Jorundr. Either way, no gold for you!" Despite this, you won't gain a bounty for killing her. You can take the amulet from her corpse and then show it to Jorundr, though he will be amused at this: "Haha! She fooled you but good. This isn't her real amulet, but a clever fake. The true amulet has a red stone. Clever girl, I taught her everything I knew. Too bad she's turned that knowledge against me. Come back when you have the real thing." Though if you've taken the key to her chest containing the real amulet, and show both amulets to Jorundr, he'll be surprised: "Two amulets? One of them must be a fake. Clever girl, taught her everything I know. Good thing you saw through her ruse." Either way, when you show him the real amulet he'll go on: "So, she's dead eh? Hahaha. Finally! Finally someone has wiped that stupid smug grin off her face. 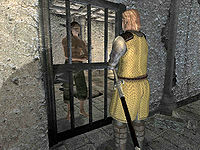 [...] If I were you, I'd get out of Bruma fast before the guards catch on that she's dead." You won't need to show him an amulet if you killed Arnora before getting jailed and hearing out his part of the story, he'll believe you straight away. If you choose to side with her, she'll know just what to do: "I knew you'd make the smarter decision. Good. Here's the key to the chest by my bed. Inside you'll find the amulet Jorundr wants. Take my amulet to him. Get the gold and bring half of it back here to me. If you don't come back, I'll let the guards in on our plan. You'll be hunted all over Cyrodiil. You don't want that do you? I don't think so. Good luck." Consequently, approach her and she's sure, "Stick with the plan, and everything should go smoothly." She'll threaten you when you speak to her: "If you try and cross me, I'll tell the town guard." When you mention Jorundr now, she'll divulge, "I'm not surprised at all that he tried to have me killed. That's his way. Always the traitor and the coward." If you ask about the stolen gold, she'll tell you, "My guess is he buried it somewhere close to town or even in town itself. Believe me, I've looked. No luck so far." She'll end the conversation reminding you, "I warn you... don't cross me." When you've been told the location of the gold, you can again approach Arnora: "He told you where it is?" When you speak to her at this point, she'll just be annoyed: "Well go get it! What good is it doing if you're standing here?" If you mention Jorundr, she'll guess, "He must have moved the loot when I left our campsite to get us supplies. Brave of him to bury it so close to town." She'll end the conversation with, "Do I have to think of everything?" Having fooled Jorundr, Tyrellius will be guarding the stash. He'll reveal, "I've taken care of Arnora, she won't be around to point the finger. And Jorundr's not going anywhere for a long time. That just leaves you..." Indeed, her body can be found when you return to her house. Since Arnora will perish throughout the quest either way, the people of Bruma will comment on the event of her death: "Arnora was killed. Such a shame. I wonder if Jorundr had something to do with it? I wouldn't put it past him." Jorundr certainly won't miss her, apparent when you end a conversation with him at this point: "She was an evil, evil woman. ", or "Maybe I'll never see the sun again, but neither will Arnora!" This page was last modified on 20 January 2019, at 22:03.